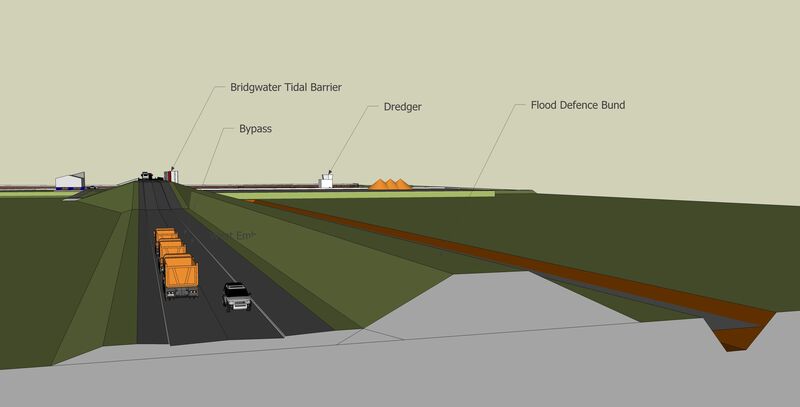 On the 15th March 2017 Sedgemoor District Council and the Environment Agency confirmed the preferred location for the Bridgwater Tidal Surge Barrier. 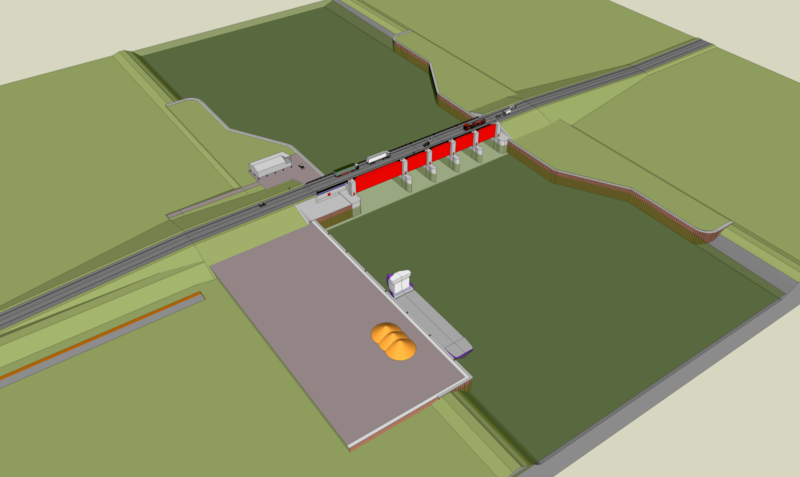 It is a site within the town selected on the basis of the cost of the barrier and according to the Mercury later in the year the scheme will be presented for public consultation. There appears to be no Plan B. Perhaps Bridgwater should have a Plan B and the following idea is an option that could be looked at. In 2009 assessment of the impact of climate change identified Bridgwater’s tidal defences needing future improvement. The two part solution is a barrier in the River Parrett (Bridgwater Tidal Barrier) and the raising of the downstream river banks. After the 2014 fluvial flood and although not designed to have any impact on a similar event the decision was made to bring forward construction of this planned tidal defence. Two option studies (2009 and 2016) looked at potential locations and solutions and none of the studies looked father downstream than Pawlett Hill. 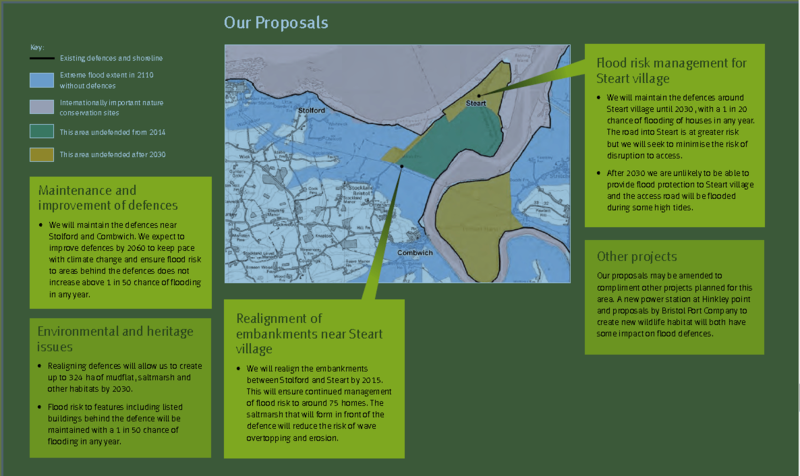 In the intervening period of the studies the EA’s Steart Peninsula scheme redefined the hard edge of our flood defences to Combwich and Stockland Hill to its rear whilst the extension to the Cannington bypass was fixed. Combwich is a unique location backing into the Stockland Hill it borders the edge of the EA’s recent Steart Peninsula scheme whilst some 2000m to the East is the base of Pawlett Hill and the last part of the Polden Hills. A raised bank between Combwich and Pawlett Hill would seal off the sea apart from a small gap of low lying land at Walpole that can easily be closed and completely sealing off the Levels south of the Polden Hills. Combined Flood Defence Bank and Bypass looking from Pawlett Hill towards Combwich. Such a scheme would provide the largest area of protection to community and farmland alike. Whilst the river is wider than the EA’s preferred locations it is often empty of water at low tide and the associated ease of construction would reduce costs and no bypass channels would be needed, money would be spent on useful structures rather than temporary channels in dangerous soils farther upstream. It is believed to have been a ford where people could walk across the river. The River Parrett at Combwich with Stockland Bristol escarpment/hill beyond. At Combwich either a barrier or a barrier & bridge could be constructed and as a consequence the planned works raising of river banks, modification of Dunball Wharf and the assumption that the river banks will require major upgrade works twice in the 100 year lifespan of the EA’s proposed scheme could all be avoided. It is unfortunate that so close to deciding on a project that will impact Bridgwater for many years we have still not looked at the bigger local picture. Should we not be building something like this? Shouldn’t we also be considering? We understand the EA has a problem; its remit is to protect communities not to ensure that those communities have land to grow food on. Despite 50% of the world’s soils being degraded the EA will not adequately protect farmland; the Dutch use 1:10,000 as the return period in their flood defences and we use 1:200. However with seawater one event is all that is needed to ruin the land especially our heavy soils. Parts of Lincolnshire’s arable land are still affected 65 years after the 1953 flood. A recent report “British Food; what role should UK producers have in feeding the UK?” identified worldwide food insecurity and the need to increase agricultural production for export as well as UK consumption. It is quite irrational that the EA’s present scheme provides the same level of protection to around 1000Ha (2500 Acres) of farm land against tidal (seawater) flooding as it does for fluvial flooding running off the hills. A situation further compounded by land values that are currently insufficient to make it economically worthwhile to recover if the sea gets in. Our farmers may about to make an involuntary contribution of £25m as their land become of little value, land that could be better protected. It will no doubt be a short time after such a seawater flood event occurs that the EA suggests extending their Steart Peninsular scheme up to the back door of Bridgwater. Raising our river banks to protect land is not a long term solution to rising sea levels and is ultimately unsustainable; the sea will win as King Canute learnt. Sedgemoor is under serious threat from external development. 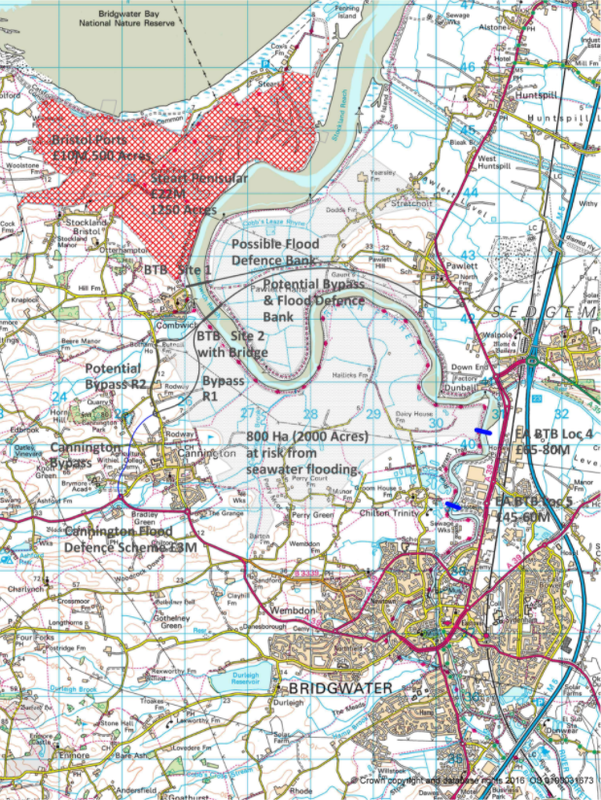 The EA has taken 700Ha (1750 acres) at Steart and Bristol Ports has taken 500 acres that will be given to the RSPB. Bristol Ports note that their container port scheme will benefit Bristol’s economy to the tune of +£100M a year whilst Sedgemoor will continue to lose farmland, jobs and economic activity. From the Bristol Ports website “studies by Bristol Port estimate that the proposed terminal will generate over £114m a year in the local economy through employment and multiplier linkage” that local economy does not include Sedgemoor or neighbouring Somerset districts. Somerset needs an alternative way forward rather than continued retreat and the increasing use of our land to permit higher value economic development elsewhere around the Severn Estuary. Our land is being turned into little more than a theme park by the RSPB, Natural England and others who proclaim to protect the environment but destroy with ease what has taken the last 500 years to establish. The Port of Bridgwater (Dunball) remains an aspiration to increase trade but a port only accessible to large vessels every two weeks because of the Moon providing high tides is never going to make it commercially. A new aggregate wharf could easily be built as part of a new barrier at Combwich removing the need for an opening road bridge and reducing the cost of future bridges Bridgwater will need. A wharf at Combwich would not be significantly different for a commercial operator. A new bypass would reduce the additional time to Junction 23 to minutes. We should recognise the impracticality of maintaining Dunball and consider relocating it downstream to Combwich. Relocation would also free up land close to Junction 23 and assist in bringing forward Bridgwater’s Northern Gateway concept. The current Hanson vessels are around 68m long and could turn comfortably in the river at Combwich as can be seen below. Bridgwater Tidal Barrier at Combwich with bypass and new wharf replacing Dunball. The recently extension the Cannington Bypass by EDF offers an opportunity that appears not to have been considered. Ending less than a mile from Combwich the new road could easily be extended to the river allowing a new bypass to be constructed to the A38 near Pawlett. Such a route would provide both a bypass and allow the diversion of the Hinkely Point nuclear fuel route and other potentially dangerous loads from going through the town via the A39 and through existing and proposed residential developments such as Cokerhurst Farm. The cost would not be enormous with little more than a mile (1800m) of poor ground to traverse, 2.5 miles from Pawlett and in total 3.5 miles from Pawlett to the end of the newly extended Cannington Bypass. To put such a scheme in perspective a bypass would be just three times longer than Bridgwater’s Kings’s Drive built by the developer who delivered Morrisons distribution warehouse and the new housing development in north east Bridgwater. 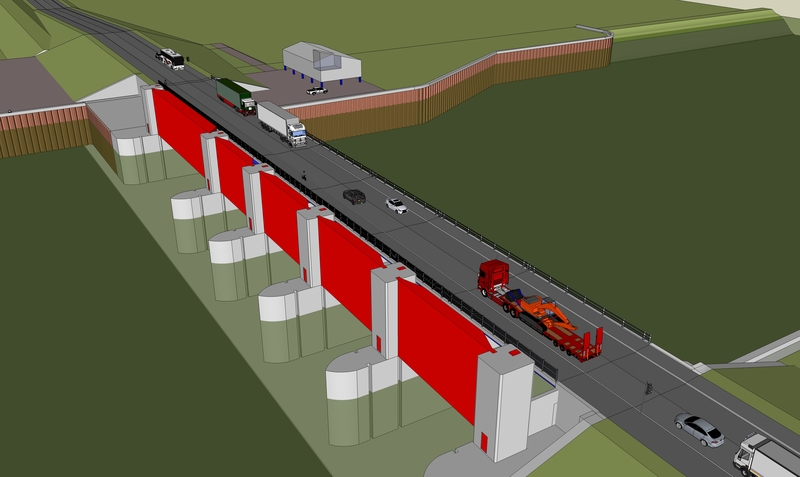 Even if the bypass was to be delayed the proposed barrier could be built to allow the addition of a bridge in the future. Sedgemoor ratepayers should at least be asked if this should be done. The EA has its plan and rightly or wrongly it’s sticking to it despite Government recognising that non-integrated infrastructure does not provide value for money for the taxpayer. Sedgemoor’s ratepayer and the UK taxpayer need a broad framework to judge whether we are going in the right direction and with the final barrier consultation due we don’t have one. What is clear is that an earlier decision not to carry out and publish a detailed economic assessment as part of the barrier studies is a problem. The study would have developed a long term plan and strategy, the lack of a study means the Sedgemoor ratepayer cannot effectively benchmark the EA scheme as there is simply little no local context with which to make a judgement. By 2024 the EA, Somerset River Authority and others will have spent locally something close to £100M on flood defence infrastructure and there will be very little to see for it. The Levels will still flood, there will be no bypass but we will see avoidable secondary defence banks like sticking plasters beside Combwich, Chilton Trinity and Walpole. SDC ratepayers will have acquired a financial millstone of continued bank maintenance that will cost ratepayers dearly over the next 100 years. We need a Dutch solution not the rather adhoc British one whose scope is slowly becoming apparent. We also need value for money and the decision as to how much to spend and where to spend it should be the communities and not handed down by the EA. They can provide technical options but they should not decide. 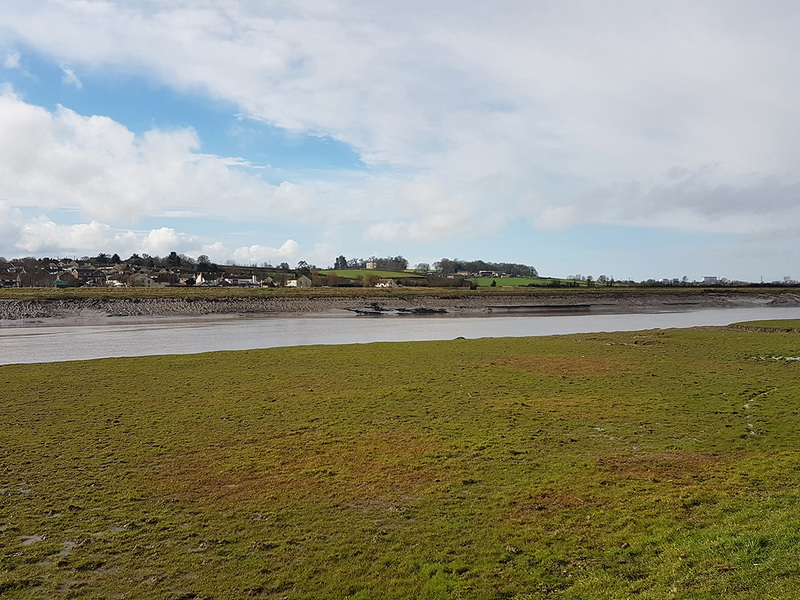 The long term loss of a further 2500 acres of farmland threatens Bridgwater’s long term economic development as Bridgwater’s continued growth to the North West is currently being decided by the Environment Agency. The planned secondary flood defences will be built so close to communities that they will need moving to permit further growth. There is a lack of foresight and vision in the development of Bridgwater’s future by risking all the economic progress made in recent years. With the comments on the Draft Local Plan closing on the 17th March people should be commenting and expressing their views. Sedgemoor’s low lying land means it needs a long term deliverable strategy for it’s a future before the sea arrives at our children’s door. It is always easy to criticise so I have attached some images that illustrate what a barrier at Combwich and a bypass at White House Rhyne might look like and the routes that they might follow. This plan will see an inter-tidal estuary returning and ultimately becoming “mud flats” again. 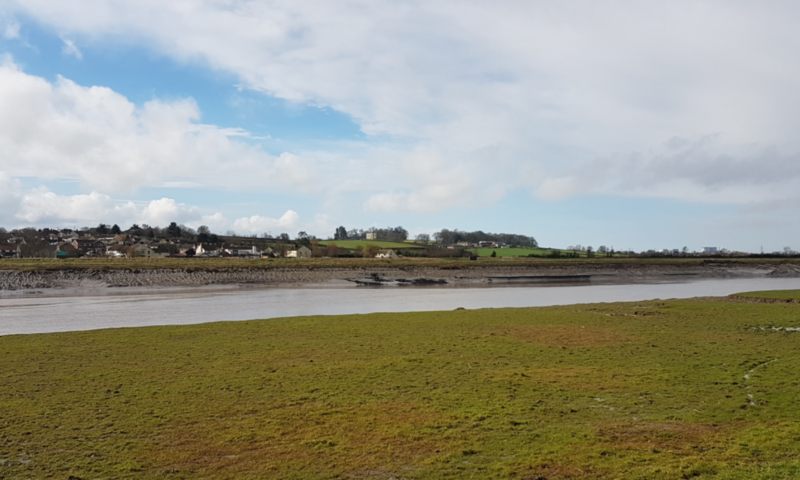 The large amounts of sediment from the Severn Estuary will be deposited into onto the land trapped by the old banks and destroying the typical Somerset landscape of the existing Pawlett Hams bird reserve. The wanton destruction of areas of farmland to allow economic development and as compensatory land for loss of habitat elsewhere in the Severn Estuary is questionable when there is no compensation being paid by other areas bordering the estuary. The Route of Flood Defence with without a Bridgwater Bypass. 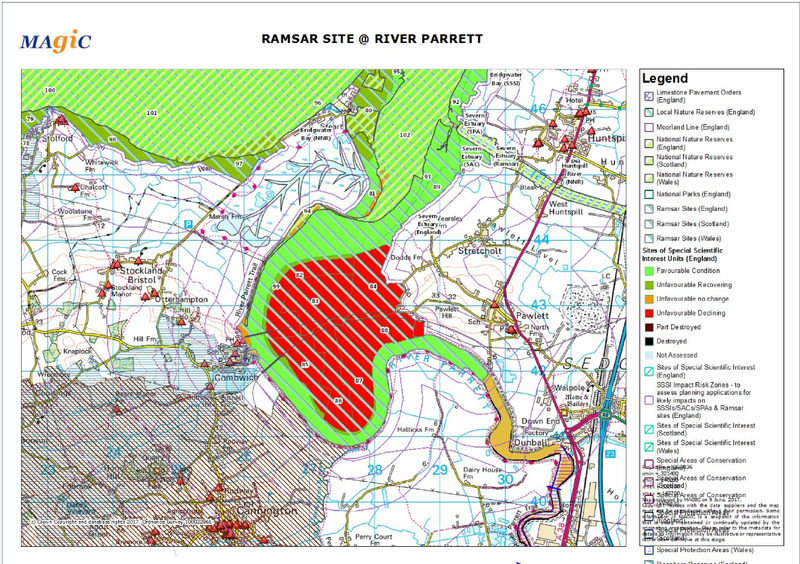 There is no reason that a scheme cannot be developed at Combwich that recognises the Ramsar site and also protects the people and environment of the whole of the South Somerset Levels. This SSI should not be used as an excuse not to come up with the right answer.